Sundays are usually about signage here on the Bogs blog, but today I’ve been playing with sunflowers and find them much more interesting than any of the signs I’ve photographed recently. 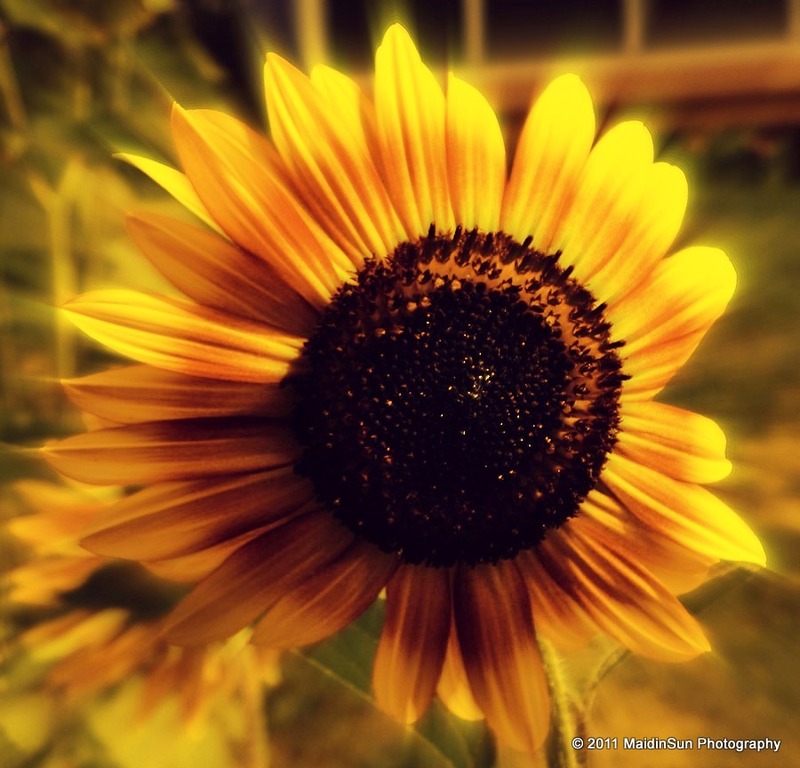 The sunflowers in this post have been processed either in Photoshop or Picnik or both. Some were just tweaked and resized. Others (like the first two) I played around with just to see what would happen. It’s an odd day weather-wise. Breezy with an almost cool feeling, yet so humid that you end up sweating fairly quickly. It’s as if we’re on the cusp of the cold front, which we probably are. 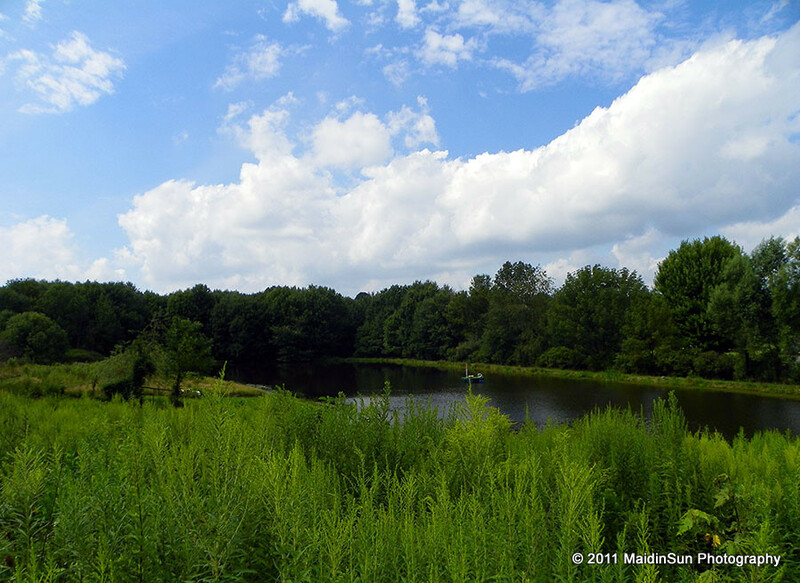 We had thunderstorms in the middle of the night, and a few drops of rain here and there throughout the day. A colleague of M’s invited us over for Sunday brunch today. The colleague is a fellow from India whose parents are visiting him here in the U.S. for the first time. He has lived here for 12 years, I think he said. His parents, very traditional (he told us), have resisted his invitations to come to the U.S. in the past, not wanting to visit this country. But over time his parents’ friends have been here for visits and recommended they do so. In a peer pressure sort of way, they changed their minds and decided to come. The Colleague is a wonderful cook. We had omelets flavored with cilantro, chiles, and Indian spices, an Indian version of hash browns, and gulab jamun with vanilla ice cream for dessert. The omelet and potatoes were spicy and flavorful. The dessert was just the right touch to tame some of the spiciness of the meal. It seemed as though we were eating off of plates that never emptied as The Colleague kept serving us until I finally sat back and sighed (okay, maybe it was more of a moan or a groan of satiation), and The Colleague’s father smiled and said, “You are full?” as if that was the best possible thing in the world. I don’t think I’ll need to eat again for a day or two. I had not met The Colleague prior to today. He is a very interesting man. I thoroughly enjoyed our brunch and our visit with him and his parents. Because I have an interest in Indian food, he spent a little time showing, and allowing me to taste, many of the spices he has in his spice cabinet. Some I was familiar with. Others I was not. I mentioned I had a recipe that calls for mango powder, something I’ve been unable to find in our local stores. He gave me a small gift of some he had on hand, and I’m looking forward to finally making the recipe with all the ingredients it calls for rather than trying to work around the missing ingredient. For my outdoor time today I went out for a good long walk in hopes of working off some of that delicious brunch. I probably need to walk about ten more miles to do that, but at least I burned a few calories. The asters are starting to bloom. I’ve been watching for them. They usually follow the goldenrod so I knew they would show up soon. I love the way the purple of the asters looks against the yellow of the goldenrod. Can you tell I've fallen in love with this sunflower? I've never seen one this color before. I'm enjoying the rich color and the texture. It reminds me of velvet. As soon as I find a good patch of the two of them together, I’ll take a few photographs. The asters are beautiful; especially the purple ones… I love Indian food so I enjoyed your retelling of the meal. Beautiful summer flowers. 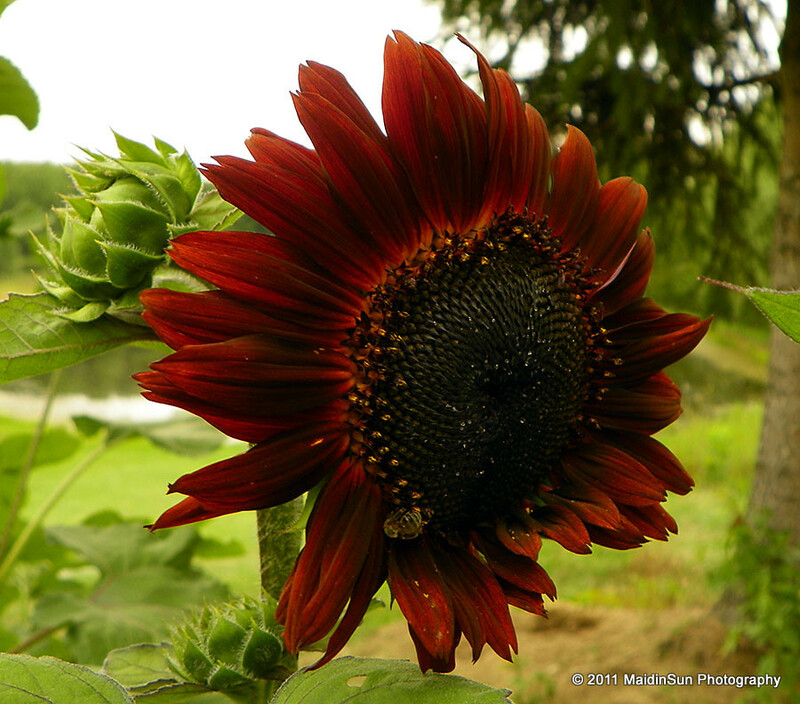 Especially love the red sunflowers. 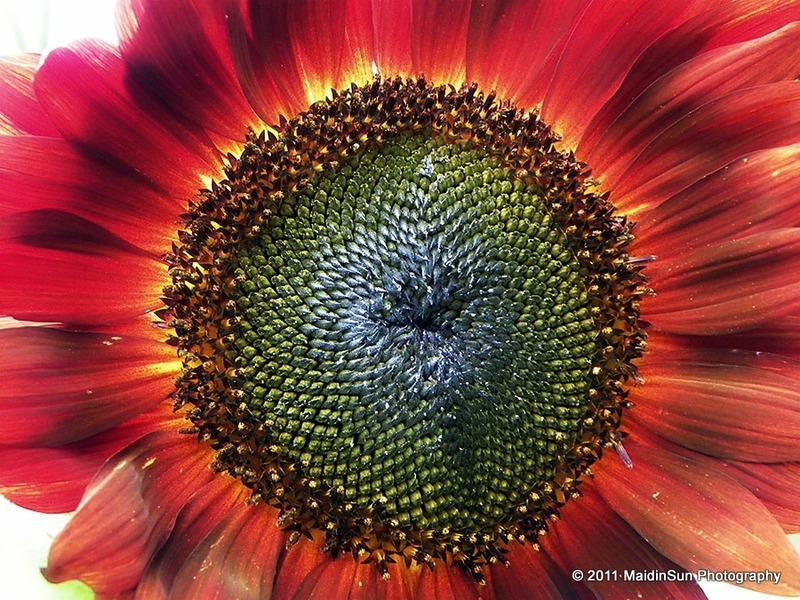 A very nice collection of sunflower photos. I do like the black and white as B&W seem to allow one to see more detail–my opinion and I’m stickin’ to it!! Interesting post about the Indian food–I like it too especially the vegetarian dishes. 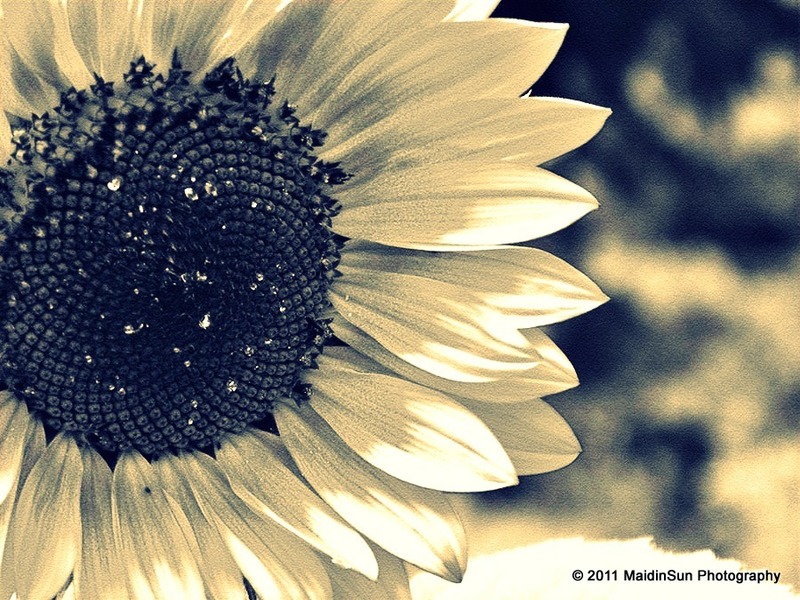 The second to the last sunflower pic is just lovely. lol, Teresita! I agree. B&W does bring out the details. 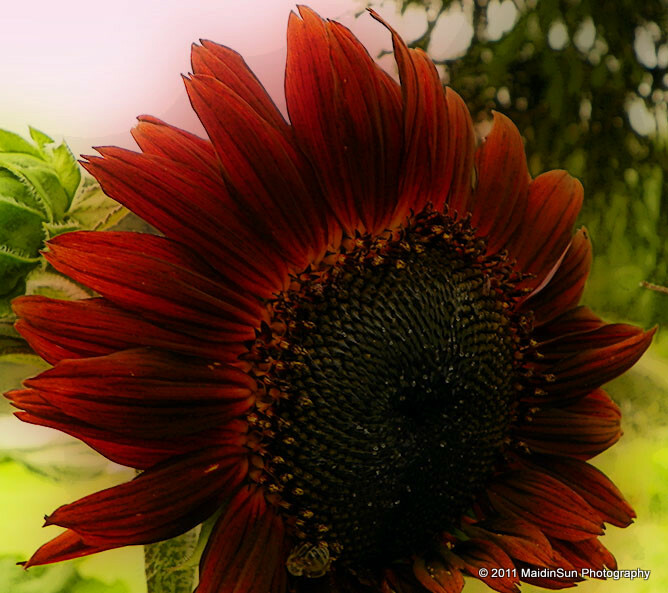 oh your sunflower shots are SPECTACULAR! 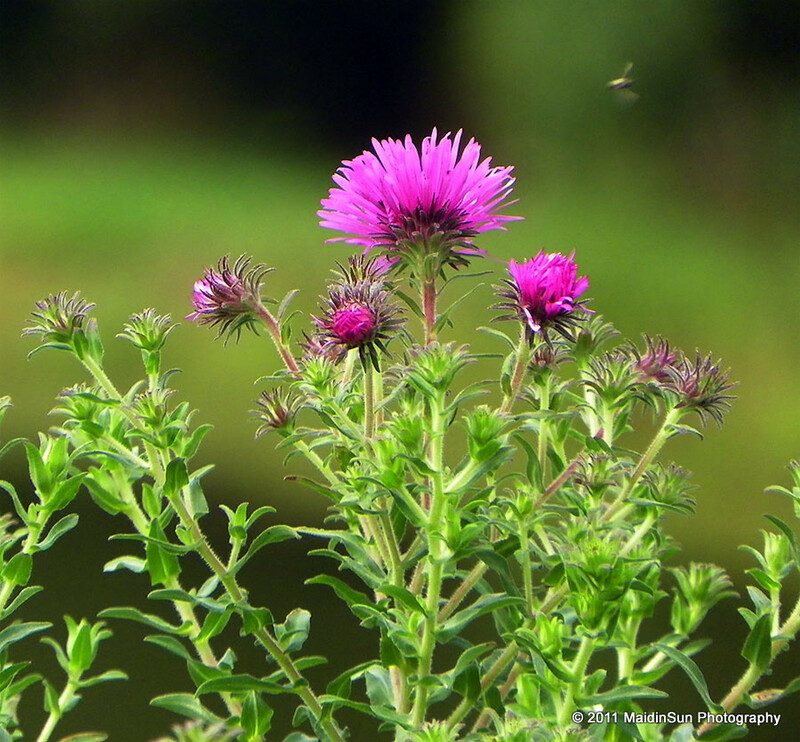 And those purple ones are asters – I thought they were clover. I have them all over the property. I too love Indian food, but have never heard of mango powder. Interesting. Have you ever been to India? You would love photographing the colors there, Robin. I have not been to India, but it is on my list of places I want to visit. Talking with The Colleague and his parents at brunch has made me want to go all the more. 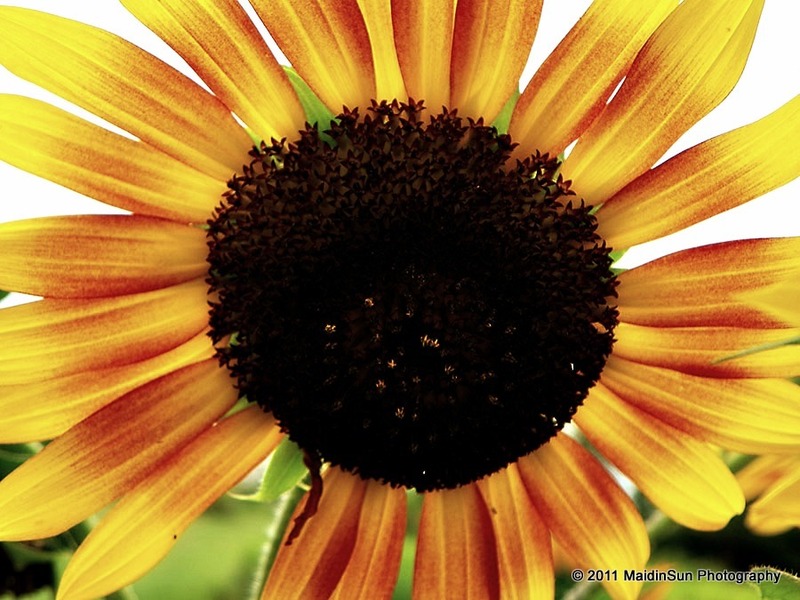 Sun flowers always make me smile..they seem brave and brazen as if…I don’t care if you want to be dreary…I’m goimg to shine! Beautiful selective focus in that last image! 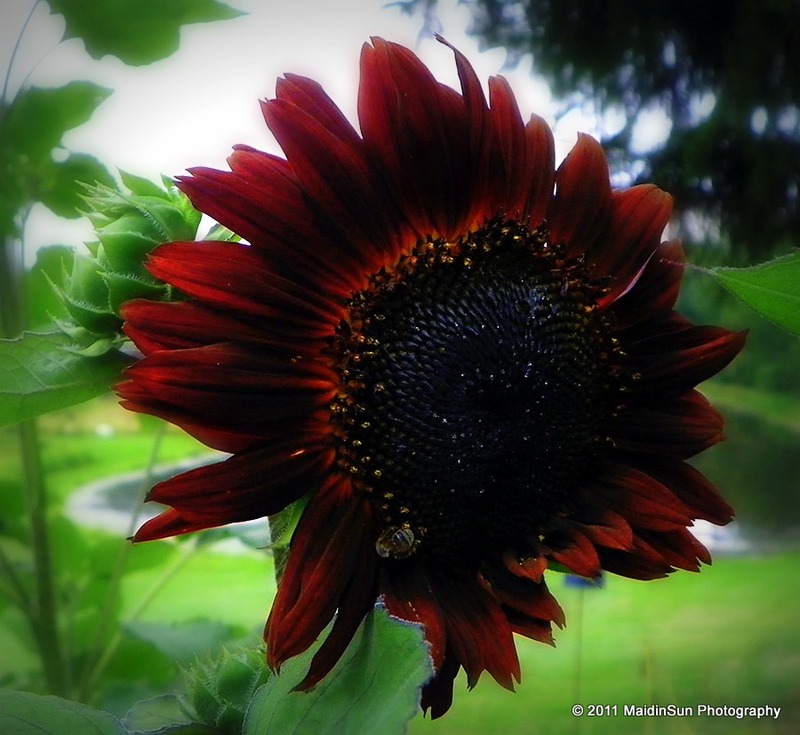 I’ve never seen a red sunflower before, either. SO beautiful! The last one is gorgeous, too… love the angle you chose, and you got some really nice detail in the leaves. 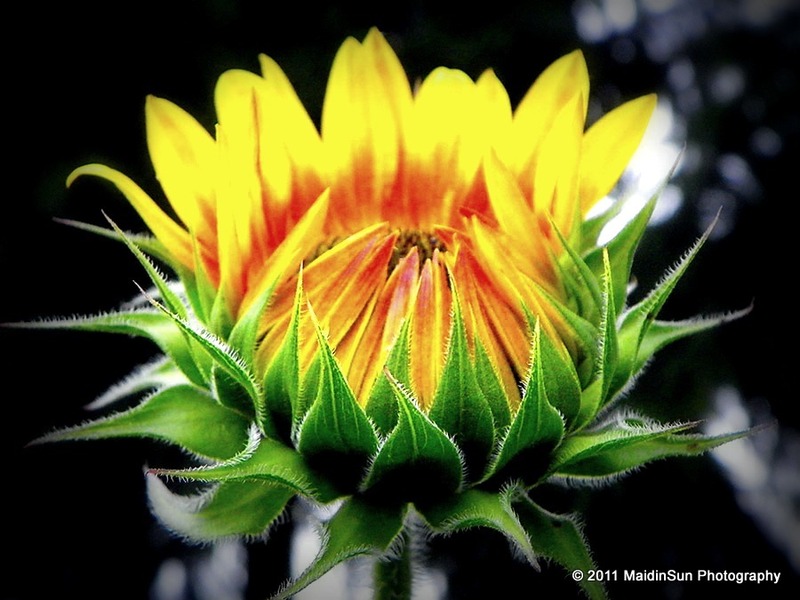 Such wonderful sunflowers – and stories! And, to echo a few others, let us know what Indian dish you’re making. Please? Wow beautiful sunflowers! Ive never seen a red one either! And the food from your brunch sounds yummy! I can see why you’ve fallen in love with that sunflower, amazing! I that last shot is exceptional. Are those red sunflowers? I have seen red ones growing places. I never realized there was such a think until recently. Would like to get some next year. They are, Christine. 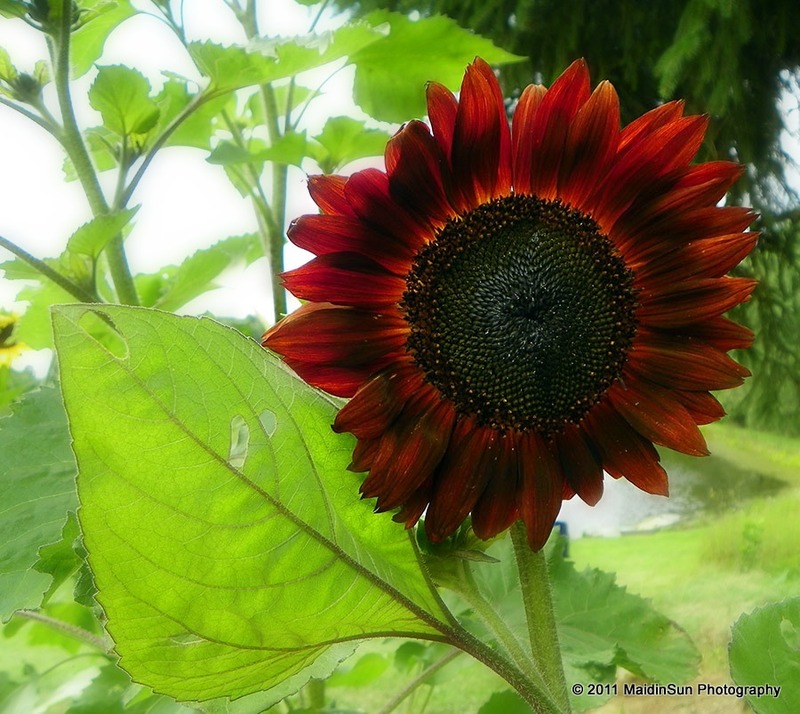 It’s my first experience with red sunflowers. We bought a packet of mixed seeds so I had no idea there were red ones until this one bloomed. I didn’t know that you struggled to find mango powder. I would’ve picked some up for you and mailed it. I mean, you wouldn’t have actually gotten it until probably 2015, but I would’ve picked it up for you. I wonder where HE got it. **sigh** You had homemade gulab jamun. Me want. I had a housemate in college that made that occasionally, and it was all I could do not to scarf down the whole batch. You going to collect any sunflower seeds? No, we don’t collect the seeds. We let the birds eat them. My kids grew a couple of sunflowers one year, which was all good until they each reached about 7′ tall and nearly pulled the fence down.. lol.. You’ve sure got a nice selection here..
lol, Brian! Sunflowers can be giants. 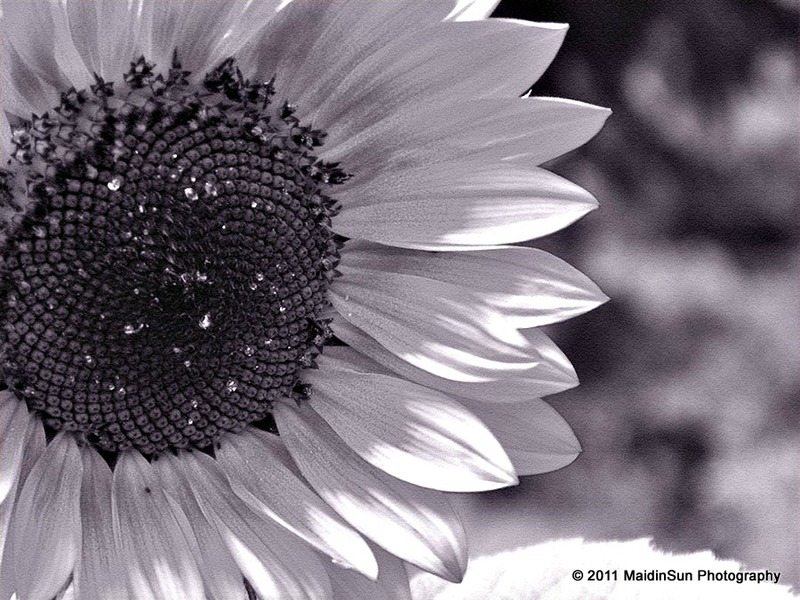 Some of the best sunflower pictures I’ve seen, and so many of them, too. I didn’t know sunflowers could be red. Spectacular!